While the best and most natural method of building up the upper arm is with exercise, this can be bypassed by surgical means. Fat injection grafting is one such approach but this often does not survive the transplantation process. And even if it does it does not create an enhanced muscular appearance but just generalized fullness. The only effective surgical method in my experience for upper arm augmentation is with the use of biceps, triceps or deltoid implants. The most commonly performed of these three arm implants is the bicep implant. 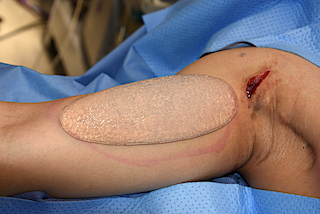 Placed through an axillary incision the bicep implant is placed in a subfascial location on top of the muscle. While the upper bicep muscle has two heads coming off of its origin from the scapula, it merges into a unified single muscle at the point when it crosses the axillary fold. This permits a small fascial incision to be made and the subfascial plane entered. Because the biceps is a gliding muscle that has to continously contract and lengthen, there are no strong adhesions between the muscle and fascia. This makes pocket dissection straightforward and uncomplicated. The choice of the biceps implant to be placed into the subfascial pocket is based on preoperative measurements. The length of the implant should accommodate that the muscle will contract. Thus the length measurement should be done with the arm bent at 90 degrees. The width measurement should consider that the muscle is curved or has a convex shape and is taken at the mid portion. Height or projection of the implant, which is greatest in the center, averages between 1 and 2.5 cm, based on the patient’s aesthetic size preference. Bicep implants act as a spacer between the muscle and the overlying fascia. Its smooth surface allows the muscle to glide in contraction underneath it.